Jack Earle helped to complete a miserable weekend for Spenser Wilson Halifax League leaders Thornton yesterday. The Mytholmroyd opener hit 159, including 10 sixes, as his side registered a 108-run home success over their Bradford opponents in the Parish Cup second round’s plum tie. Royd, beaten by Calder Valley rivals Booth in last year’s final, powered to 377-5 with Earle and Spencer Harris (63) adding 158 for the second wicket. Late quick runs from Tom Conway (47 no) and Luke Sutcliffe (23 no) set Thornton a mountainous task. Earle then dismissed both Thornton openers before leaving it to his teammates. Josh Hutchinson typically produced some fireworks for the visitors, with 136, but Zahid Mahmood’s 4-66 helped limit the visitors, who had lost at Booth in the league on Saturday, to 269. The top side in the Premier Division table may be missing from tomorrow evening’s draw at Sowerby Bridge but the next eight in the standings will all be there as the remaining ‘minnows’ were all swallowed up. Booth, bidding to lift the trophy for the third year running, crushed hosts Copley by 233 runs and will hope to back at the ground for the final on the first Sunday in August. Rob Laycock made 114 not out and shared stands of 123 with opener Jon Midgley (102) and 169 with Hasnain Wajid (82) as the visitors amassed 380-3. Usman Saghir dismissed the top three in the Copley order and Moazzam Ayub the next four as the hosts replied with 147, William Rushton (54) offering most resistance. Matthew Whitworth hit 70 not out as Warley brushed aside hosts Leymoor from two division lower by eight wickets and Joseph Ousey hit 114 as Oxenhope justified their status as hot favourites at home to Stones, winning by 193 runs. Sowerby St Peter’s openers Ben Watkins (91 no) and Adam Clarke (67 no) knocked off the 159 runs needed to beat visitors Outlane. Shelf Northowram Hedge Top and Southowram narrowly justified their division-higher status against Blackley and Sowerby Bridge respectively. Opener Dominic Walsh’s 101 not out was in vain for Blackley, whose 259-3 at Hedge Top was almost enough with the home side’s final pair getting the winning runs. Southowram were two wicket winners at Walton Street. Bridgeholme have had a torrid time recently and duly bowed out at Triangle but they gave their hosts a scare. The Grassy Bottom side were 27-4 and 95-7 before experienced skipper Michael Midwood (56) came to their rescue in an 81-run partnership with Jack Gledhill (46). A total of 184 is very modest at Triangle but it proved enough as the Eastwood side were all out for 171 after rallying from 44-5 with 72 from veteran Mohammed Basharat. Thornton’s day to forget was made complete by a 145 run defeat at Mount in the Crossley Shield competition. Luddenden Foot upset neighbours Sowerby St Peter’s by four runs in a high-scoring contest with Joel Cleary scoring an unbeaten 116 for the High Lea Green side. The other successful second teams yesterday were Blackley, Booth, Bradshaw, holders Triangle, Illingworth St Mary’s and SBCI. 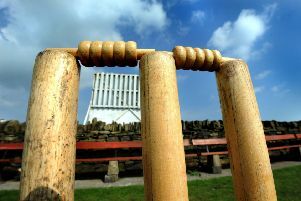 Chris White scored an unbeaten 101 as Blackley thrashed last year’s Premier champions Bridgeholme while Booth’s Steve Butterworth was another batsmen to make three-figures, scoring 106 against Sowerby Bridge. Booth and Triangle are the only two clubs still involved in both competitions.